A shy lost dog that began using a feeding station. This picture was taken by a trail camera that was aimed at the food bowl. The point person (defined in Part 3) should keep a sighting journal. It is hard to remember all of the details from a phone call. Something that may seem insignificant at first may become very significant as time goes on. So most importantly, get the name and phone number of the caller, so that you can call back with any extra questions! Record all of these details in your journal and then post the sightings to a map. You can use an old-fashioned paper map or you can use an interactive google or Mapquest map that you can share with your volunteers. Click this link for our article on making a google map. We recommend that you NEVER share this or any sighting information with the public. Leave food and water! Anything except dry kibble (which doesn’t have an odor). Again, think smelly, scrumptious food. 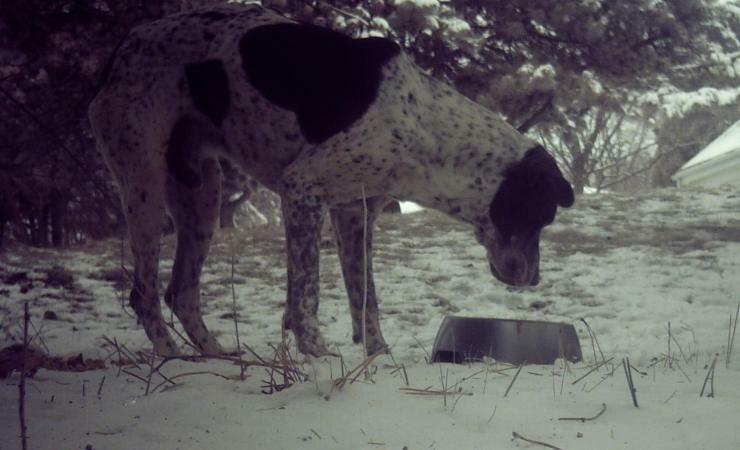 If you have a trail camera set it up facing the food so that you can see if the dog is approaching and eating when you aren’t there. Read our article on setting up a trail camera at this link. If you don’t have a trail camera, sprinkle fireplace ashes or cornstarch around the bowls so that you can examine the area for tracks when you return. Shelters and Rescues, Trail Cameras Helping Lost Pets, map, mapping, recovery, sighting journal, trapping technique. permalink.